Not sure how to promote your Vernon business at the trade shows? Pull-up banner from Print Factory is perfect promotional item to advertise and promote your company at business events in Vernon. You can also use it at your office or retail store front in Vernon as marketing piece. Our Pull-up banners include FREE travel bag which is perfect for transportation and storage. It is easy and fast to assemble the banner – just pull it up. 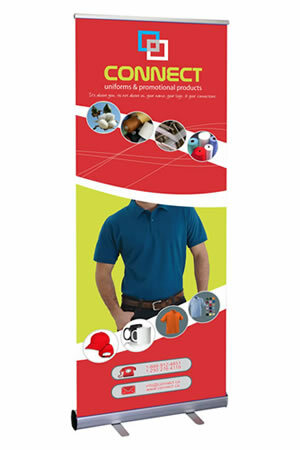 Let our design team to design pull-up banner for your Vernon company. With huge experience and creativity our designers will make sure that you banners is impressive while delivering the right message to your customers in Vernon. Try our design services and you will not be disappointed. Have questions about this product or not sure whether this product is right for your Vernon business? Please don not hesitate to contact us and we are more than happy to assist you and answer all your questions via phone, email or in person.